Tiger Woods is swinging a driver without pain, and his agent says doctors have cleared the former world No. 1 to practice without limitations. 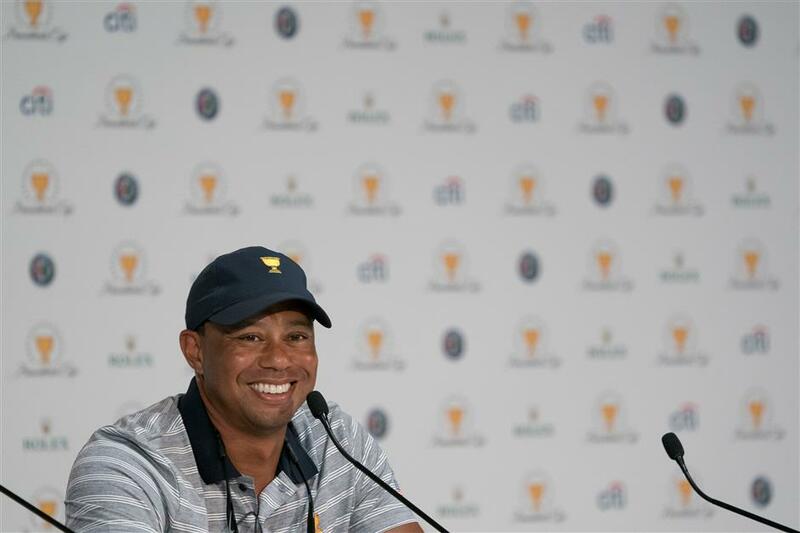 Team United States assistant captain Tiger Woods speaks at a press conference during the practice round for the Presidents Cup at Liberty National Golf Course in Jersey City, New Jersey, on September 27, 2017. "We haven't even addressed when he comes back to play again. We have not addressed one thing," said Mark Steinberg, Woods' agent at Excel Sports Management. "He wants to play this so conservatively." Steinberg said Woods received a "good report" last week from doctors who performed fusion surgery on his lower back in April. Woods posted a video on Twitter on October 7 of him hitting a smooth iron shot. Then on Sunday, Woods posted another video — in a red shirt, no less — hitting a driver. Woods, whose last victory was four years ago at the Bridgestone Invitational for his record 18th World Golf Championships title, has not played since he withdrew from the Dubai Desert Classic on February 3 because of back spasms. Two months later, he had a fourth surgery on his back in 19 months. Woods first posted a video on August 31 hitting pitch shots. Steinberg said doctors last week allowed Woods "to proceed with no restrictions", which is when he began posting video of fuller golf shots. "He has started to hit balls at a more aggressive rate," Steinberg said. "He feels really good, but he's going to take it very slowly. I think he's excited that he's not feeling pain. That's what gets him excited, being able to bend down and pick up his kids. "He's taking it from wedges and short irons to the longer clubs. But he's still doing it in a really cautious manner." Woods was an assistant captain of Team United States at the Presidents Cup two weeks ago, and he said then his priorities were to get his health in order, make sure he is pain-free and then wait on word from his doctors. "I'm still training. I'm getting stronger," he said on September 27. "But I certainly don't have my golf muscles trained." Woods last year returned after 15 months to play in his Hero World Challenge in the Bahamas, where he finished 15th in an 18-man field. The tournament is a week after Thanksgiving. Two spots are still available for sponsor exemptions to players in the top 50 in the world, or to the tournament host, which is Woods.